The legal profession is a vocation that is based on the knowledge of law and its applications. Those who pursue these ‘vocations' collectively form a body of individuals who are qualified to practice law in particular jurisdictions. The learned occupation of these individuals is to study, promote, uphold and enforce the collection of rules imposed by the authority. This can be done in the court of law (becoming a Litigator) or outside the court of law (becoming a consultant or a legal advisor). 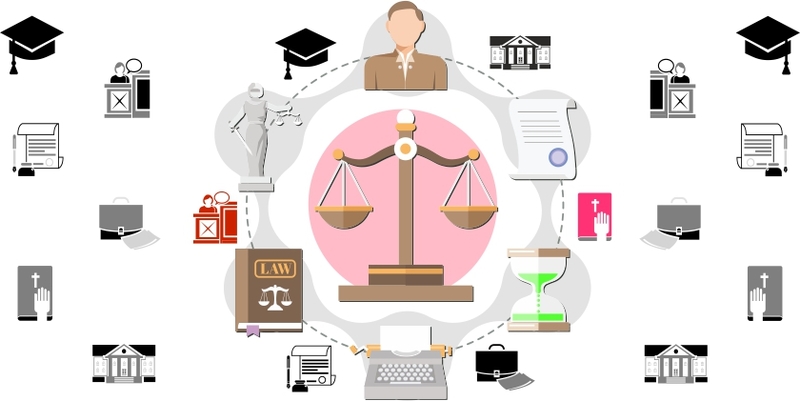 A Lawyer is a person qualified by education, training and work experience working at a law office, corporation, governmental agency or other entity and who performs specifically delegated substantive legal work like litigating, arbitrating, negotiating, conciliating, and moderating matters for a party which has arisen between two parties. These matters can be primarily classified as civil or criminal, therefore generally the lawyers would either take up civil matters or criminal cases. Further the practicing lawyers can specialise in the following types of laws: Constitutional and administrative law, Criminal law, Contract law, Labour law, Company law, Tort law, Property law, Tax law, Trust law and Family law or Personal law Etc. A professional who has gone through Legal Education may choose not to litigate and may become a consultant for companies and/or individuals giving them advise on legal front for their benefit. Very high at People orientation. Decently high at Academic orientation. Ability to communicate well with different kinds of people. Articulate in writing and speaking. Ability to think and argue logically. Interest in Politics and Social Issues. For admission in 5 year Integrated Law programs at 21 National Law Universities across India. For admission in 5 year Integrated Law program at NLU Delhi. For admission in 5 year Integrated & 3 Year Law program across 70+ Private Colleges in India. Remarks : Results Declared on percentile basis. For admission in 5 year Integrated Law program at Symbiosis Law School Pune, Noida & Hyderabad. Remarks : Separate Application Fee to be paid for different institutions you wish to apply under SLAT. Test Followed by PI-WAT. Remarks : 10+2 any Stream. For admission in 5 year Integrated Law program at Christ University-Bangalore. For admission in 5 year Integrated Law program at affiliated colleges of Guru Gobind Singh Indraprastha Univ. Delhi. For admission in 5 year Integrated Law program at Banaras Hindu University-Varanasi. For admission in 3 year LLB Program at Delhi University Campus Law Center. For admission in 5 year Integrated Law program at UPES Dehradun. For admission to 5 Year Integrated Law Program Rajasthan University-Jaipur. Remarks : Test Followed by Interview. For admission to 5 Year Integrated Law Program at Punjab University, Chandigarh, Ludhiana and Hoshiarpur. For admission in 5 year Integrated and 3 Year Law programs at MS University-Baroda. For admission in 5 year Integrated Law program at Army Law College-Mohali. For admission in 5 year Integrated & 3 Year Law program at New Law College Bharati Vidhyapeeth, Pune. For admission in 5 year Integrated Law program at KIIT Law School-Bhubaneshwar. For admission to 3 Year Law Program at Punjab University, Chandigarh, Ludhiana and Hoshiarpur. For admission in 5 year Integrated LLB Program at Jamia Milia Islamia. Last Date : 90 Minutes. Last Date : 140 Minutes. Total Marks : Results Declared on percentile basis. Total Marks : Separate Application Fee to be paid for different institutions you wish to apply under SLAT. Test Followed by PI-WAT. Last Date : 120 Minutes. Total Marks : 10+2 any Stream. Last Date : 150 Minutes. Last Date : 180 Minutes. Total Marks : Test Followed by Interview.